Are you a coach or team manager of a sports team? 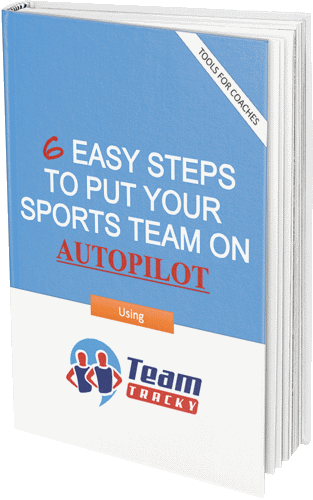 "Six Easy Steps to Put Your Sports Team on Autopilot" ebook is for you. Come for the savings, stay for the unique features. Import your team's roster and schedule in minutes. View price and features comparison here. TeamTracky works with any sports team and helps keep track of roster, scheduling, attendance & availability, team fees & payments, tracking lists, documents, photos, reports and communications on desktop and mobile devices. Best solution for people with multiple teams (club officials, team managers, coaches, players and parents). Need help? Our support team is ready to answer any of your questions and help you get the best of our software. Manage team roster and member profiles easily. Get all contact information in one place for better communication. Print roster for registrations (tournaments etc.). View all events for a single or multiple teams in one calendar. Synchronize calendars with mobile devices. Optionally, use event rosters and save time and confusion among the team. Team members can set their availability for events and enter time off dates such as vacations, etc. Know who's coming to the next game or practice in a flash. See attendance history for each member. Send email messages or mobile notifications in seconds. Inform team members of new events, last minute changes or important team updates, right from your mobile device. Securely keep documents needed for team registration such as rosters, waiver forms, photos, etc., in one place. No need to look at your email attachments anymore. Share event (league/tournament registration files with organizers and avoid in person check-in. Save time online so you can practice for the event a bit more. Easily keep track of team dues and member payments without the use of spreadsheets. Members can pay online, check their balance and transactions. Record offline payments on the field using your mobile device. Save those precious moments. Easily upload team photos from your desktop or mobile device. Optionally, share online with family and friends on social media. Build reports on trainer's attendance; check hours spent and sessions attended. Save time keeping track of training session hours. Keep track of items such as: snacks and refreshments, members who can join a specific event etc. Ask anything and receive responses from your members. Team members can chat live, get updates and share information about an event. Create chat rooms, share score and stay in touch with everybody. Check schedules, set availability, receive team messages and get field directions on the go. TeamTracky app is available on iOS and Android. Collect registration or other teams fees online, manage players' balances and send payment reminders. Field closed because of inclement weather? Game time has changed the last moment? 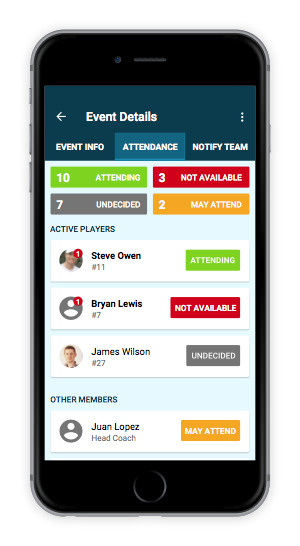 Send an email or mobile notification to any member in your club or league filtered by field location, member type, age group or team name. Build reports on trainer activity on each of the teams your organization trains. Select to print reports for a specific team and all its trainers or by trainer and all the teams s/he trains. Your staff can login to a portal with a unique login and access reports for the teams associated to your company. You still check team documents in person? Are you buried in paperwork? Ask team managers and coaches to share required documents such as birth certificates, medical release forms, etc., online. Login to your portal and view team shared documents, mark them complete and save time. "TeamTracky has provided the Rough Riders a software that complements our current team management procedures within our youth program. Having the ability to create a central hub that incorporates all aspects of team management while being accessible on the web or a mobile device means that we can provide more focus and a quality of service to our members. TeamTracky has been a great team management software and something that we would highly encourage a youth sports organization to invest in." "We are using TeamTracky to manage the roster, schedule and player availability of all our developmental program teams. Having the ability to synchronize calendars and communicate last minute updates to our members on their mobile phones is a life saver! Trainer activity report is also an amazing feature that free us from keeping spreadsheets with every hour our coaches spent on the field. We use it to create detailed invoices for our affiliated clubs and the teams we train." TeamTracky costs only $4.99/mo or $39.99/yr. Pay less and buy some gear instead. We believe simple is better. TeamTracky is made to be used by everyone with ease. Our awesome support team is ready to answer your questions fast and when you need it. We are building and serve a community of coaches, players, parents and sports enthusiasts. Used already by thousands of coaches and players nationwide. Now is your turn to use it and see the benefits. We won't share your data as most providers do because we hate it when they do that to us. Start organizing your team today! Never miss another team update. Download our FREE mobile app, and stay connected to your team wherever you are with TeamTracky for iOS and Android.